Supermodel Bella Hadid stirred up a storm as she walked down the runway for Tokyo based designer Tomo Koizumi. Sashaying the catwalk for the Tomo Koizumi Fall/Winter 2019 Collection, the American model put her slim and endless pins on show. 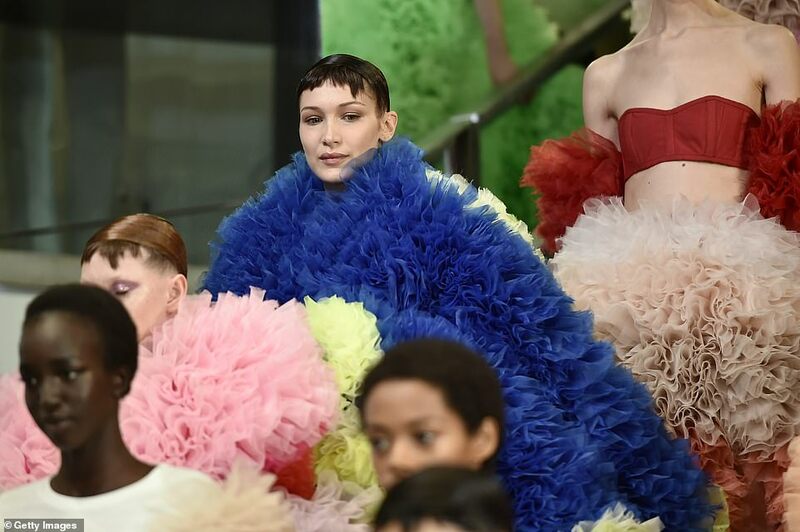 Putting on show the designer's eccentric vision, the 22 year old showed off a voluminous frilled dress inspired by paper roses. The multicolour dress featured a mix of royal blue paper rose style frills with matching mint green ones, and the dress exceeded more in width than length. Bella's brunette hair was styled into a slicked helmet-esque look with blunt fringes and the model's eccentric ensembles was paired with a minimal makeup and simple black pumps.